So far this winter has been a roller coaster of temperatures. December brought weeks of sub- zero temps, while almost every day in January was in the high 30’s and 40’s. All our snow in the valley melted and the ground was bare. Then one day two feet of snow fell, and didn’t stop. One constant has been wind–a lot of it and up to 50 mph. 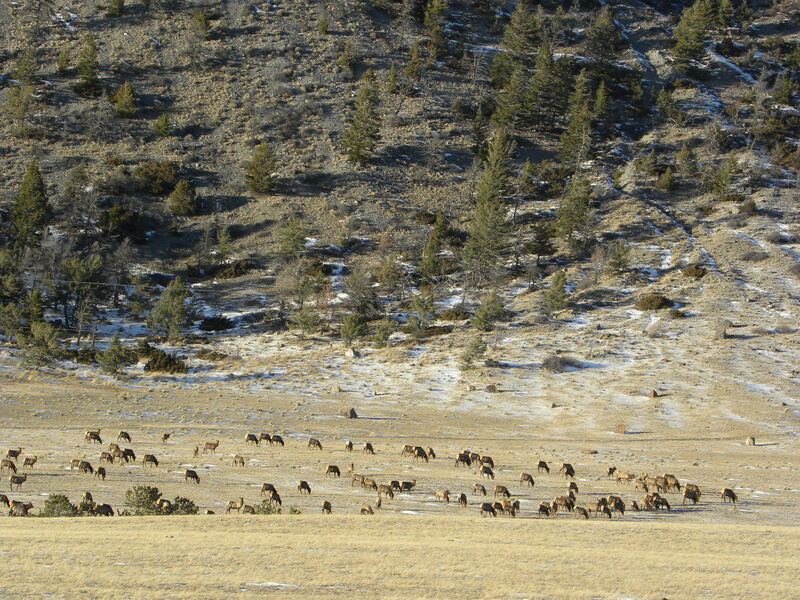 Before all the deep snows came, I spent a lot of time watching for wildlife and sometimes seeing them. 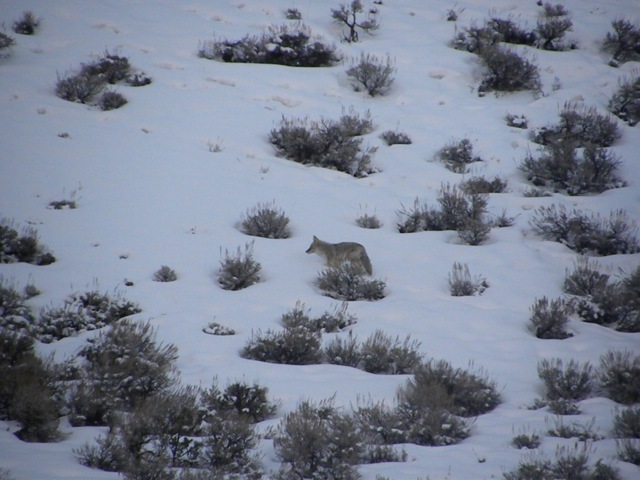 I had several glimpses of a lame coyote, with a hurt or broken back left leg. One day I saw him scurry across a wide field. I wondered if he’d make it through the winter, with his lameness as well as wolves to watch out for. Then a few weeks later I saw him stealing a large bone from a recent deer kill. It was early morning when I noticed the coyote. He saw my car and started running for cover. It was then I saw it was my limpy friend. I took a few photos and was on my way. Here’s the fellow. Who knows what happened to his leg. In his attempt to flee, he dropped his prize bone. That’s when I left, allowing him to return to it. Poor guy had it tough enough without me making it harder. 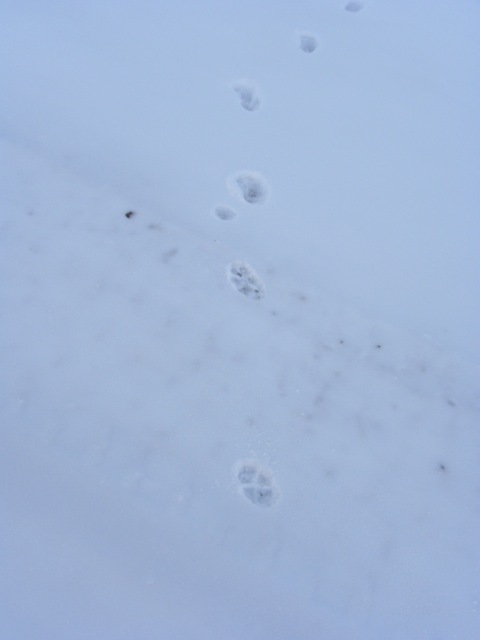 But on the way home I checked for his tracks. I was curious what a useless left back leg would look like in the tracks. You can tell what a difficult time he is having because his gait is so uneven. Look for that tiny imprint of his lame foot. Here’s a photo from January on the flats behind my house. Where’s all the snow? Here’s a puzzle. We had a few days of intense snow without a let-up. During a short let-up of the storm, I took a walk around our woods and discovered this interesting ‘hole’. It doesn’t go anywhere, but was obviously a temporary snow shelter dug out during the storm just above the base of a tree on a hillside. 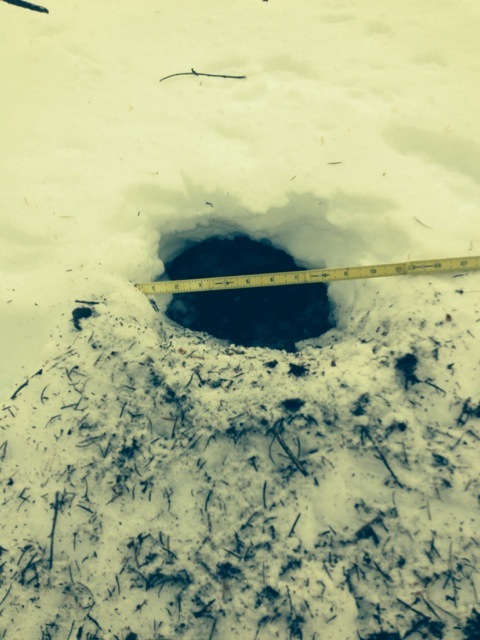 The hole measured about 6 or 7 inches across, big enough for a fox or a skunk. I have seen skunks once here, but they are rare. So are raccoons at this altitude. I wondered what could have done this. All tracks were obliterated by the recent snows. Hole that doesn’t go anywhere dug out for a temporary shelter. 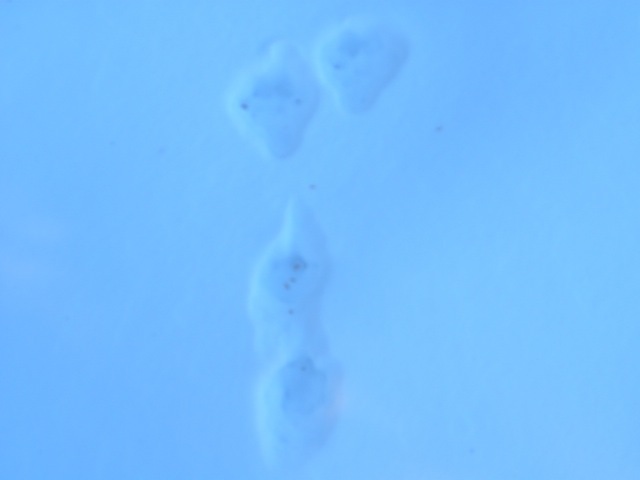 I found bobcat tracks around my house. Bobcats have become quite rare around here because of intense trapping. Bobcat pelts can go for up to $1000! and so a lot of newbies want to cash in. Wyoming has no limit on how many bobcats a person can trap and the season is long, pretty much all winter. 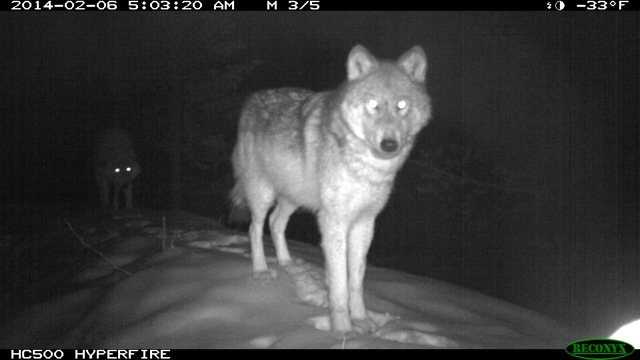 So I set up a camera trap to get some photos. I’ve never been successful catching photos of bobcats, except the few times I’ve seen them myself. 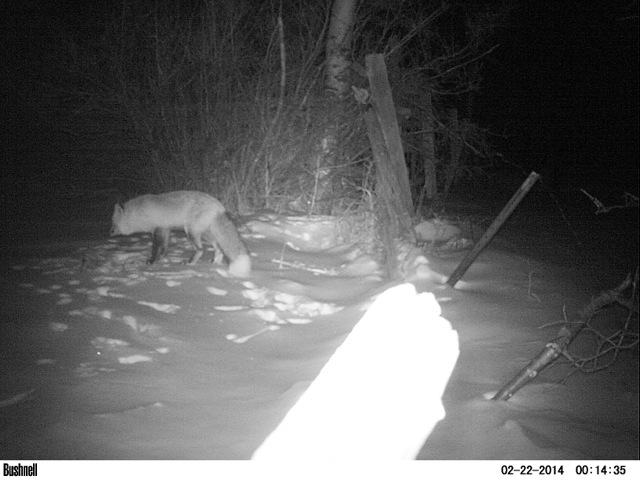 But instead of catching a bobcat, I caught a shot of this fox. I understand from some old timers around here that foxes used to be quite rare. Canines are territorial and will kill other canines in their area. Wolves kill coyotes, coyotes kill foxes. I’ve seen foxes quite a lot since I’ve lived here and I think the wolves are keeping the coyotes either ‘in check’ or enough on their toes so that there is room for foxes again. I discovered a secret game trail that is quite a hike from my house. An old water diversion ditch, it appeared the wildlife were using it frequently. I also found a deer kill nearby. 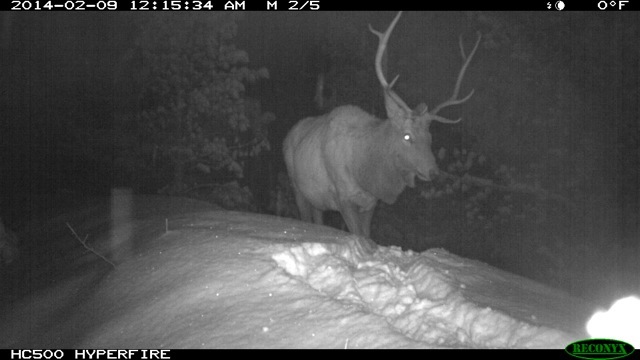 To confirm my suspicions, I set my trail camera up and left it there for 6 weeks. I got a lot of photos of rabbits, deer, elk, coyotes, and wolves. Here are a few. 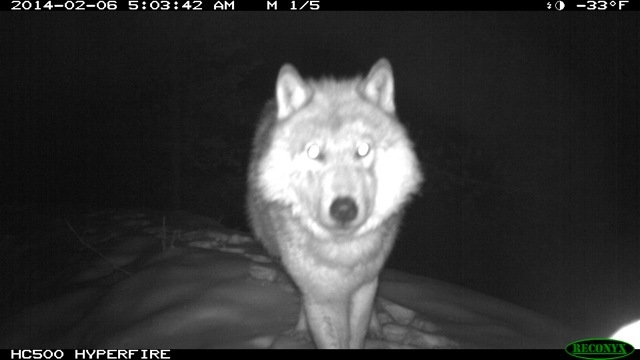 Look at the temperature on the two nighttime wolf photos. Its -33 degrees! I really do live in a special place, right next to Yellowstone National Park! My latest interest is in the smaller animals around here. 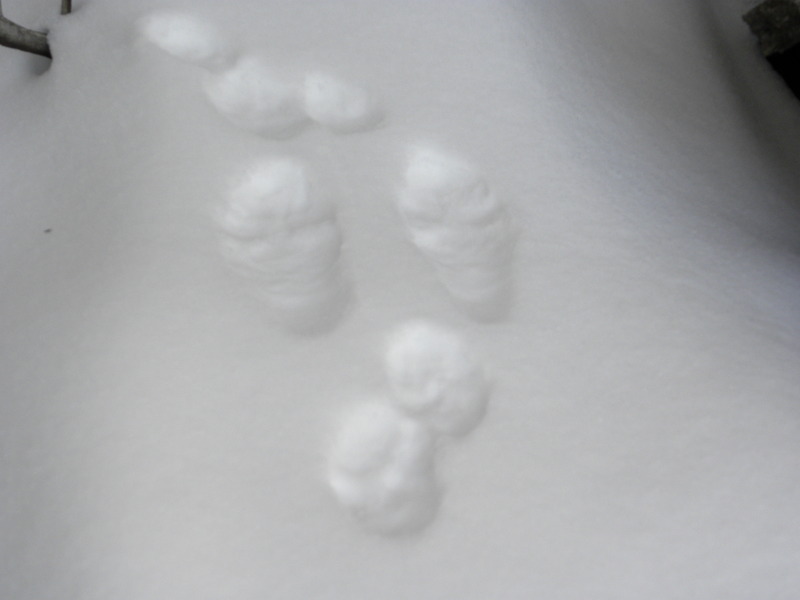 Winter snow tracking can help find the critters and I’ve started keeping my eye out for Marten tracks, which I’ve yet to find. Today was a beautiful clear day running around 17 degrees when I started out on a snowshoe trek. 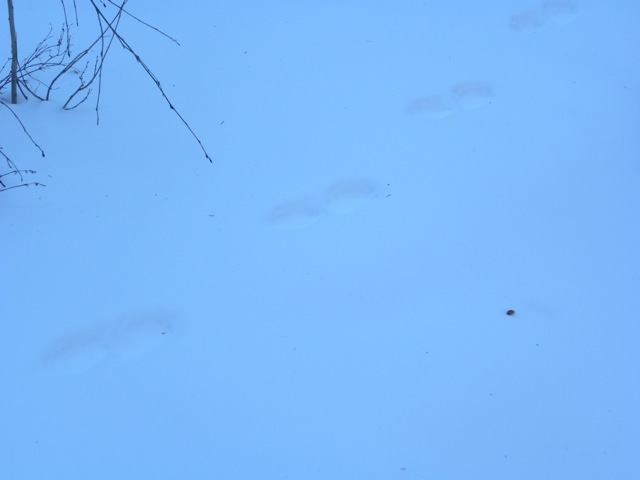 I’d heard from a hunter friend in October that he’d seen a lot of snowshoe hare tracks up Camp Creek, an area closed off in winter except to foot traffic. Since most winter visitors up here are interested in snowmobiling, this is a quiet and steep hillside with no traffic. 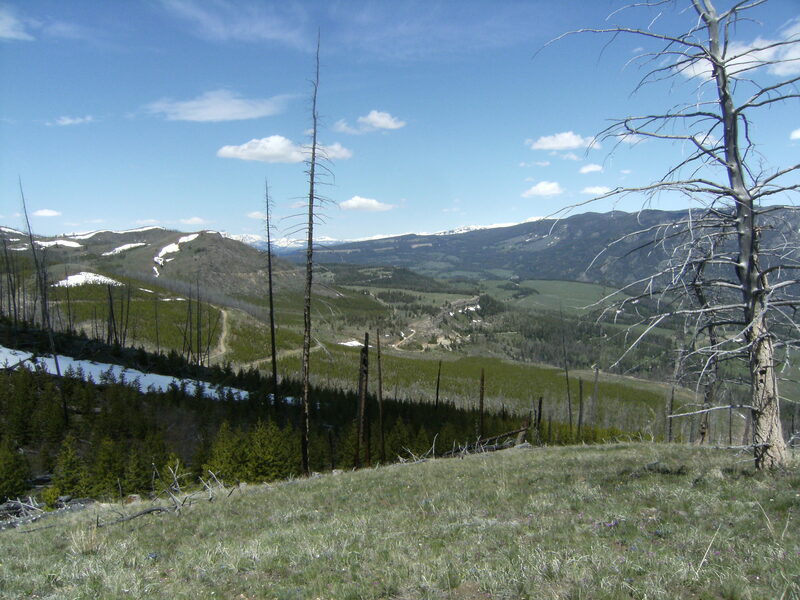 Being a north facing slope, the forest service road had accumulated over 3′ of snow. 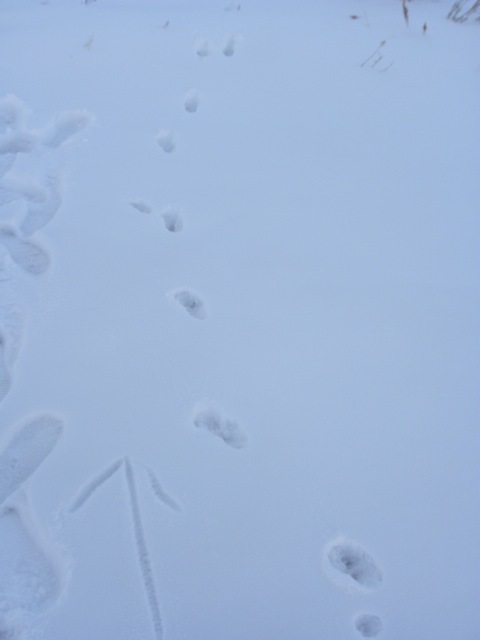 A recent snow storm left the snow soft and snowshoeing was a work-out. 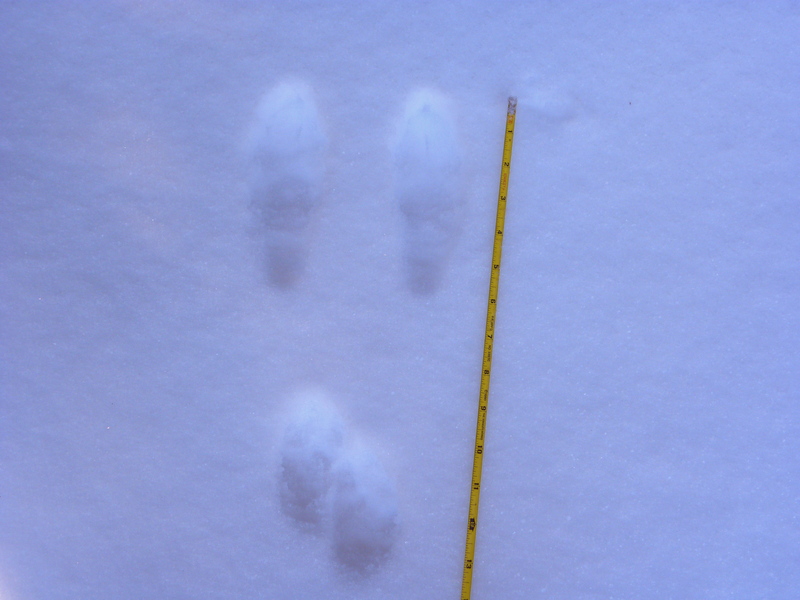 Just as my friend said, I quickly saw a lot of snowshoe hare tracks. What I really am interested in is lynx activity. 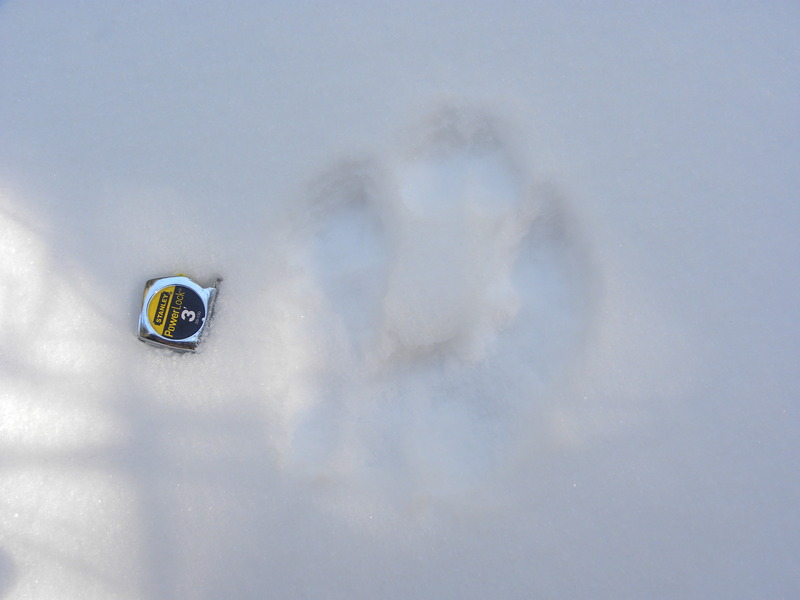 I’m not familiar with lynx, but I can recognize a cat track. 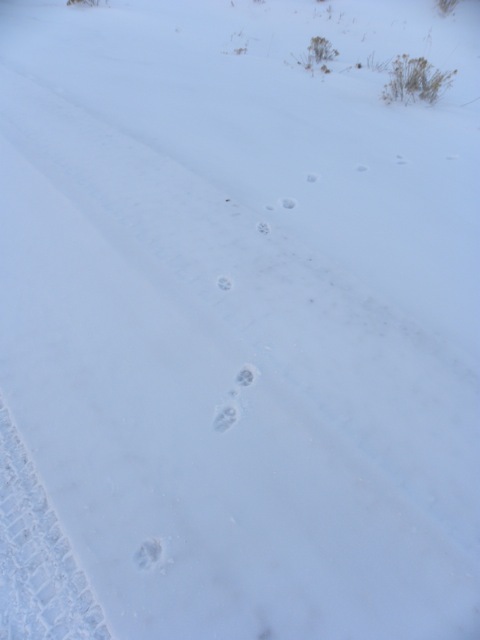 The snow being so soft, the large loping tracks I saw were difficult to identify, but appeared to be a lone coyote. There were hare runs all over the place. It was interesting to see how long the runs were, and how far out into open areas the hares ventured. With the deep snow, areas under roots and limbs made for good cover. This is a typical snowshoe hare habitat–fir and spruce forest. 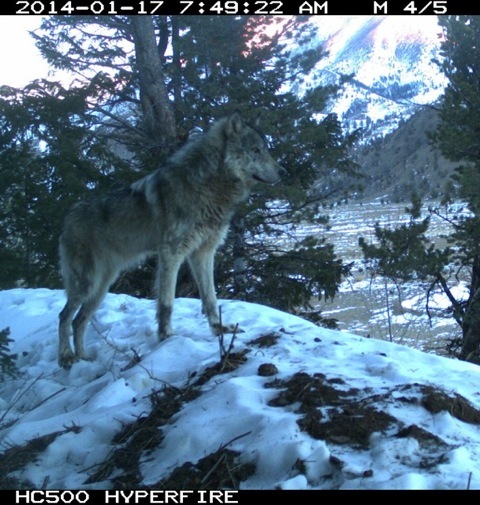 Two years ago the Forest Service hired a contractor to look at snowshoe hare habitat in my valley. 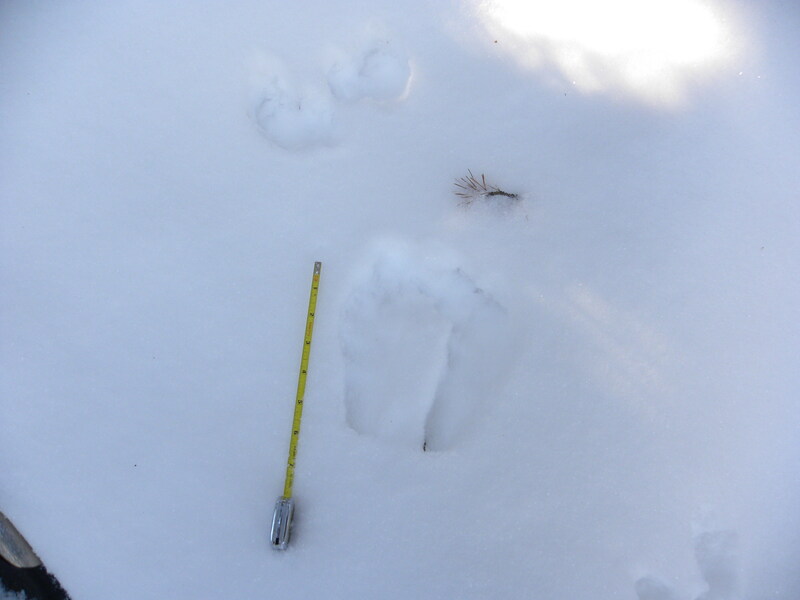 The company was doing a vegetation study for snowshoe hare to see if this was good lynx habitat. I don’t know if the results are out yet, but just down the road a few miles I can say for certain that there is good hare habitat with lots of hare. Now, to see if I can find a lynx!